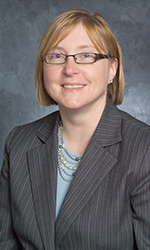 Christine O'Neil, Pharm.D., has been elected Secretary of the Pennsylvania Chapter of the American Society of Consultant Pharmacists (ASCP) for the Nov. 2016–Oct. 2017 term. Dr. O'Neil is a Professor of Pharmacy Practice in the Division of Clinical, Social, and Administrative Sciences at Duquesne University. She currently serves as Director of Curriculum Development. ASCP is the only international professional society devoted to optimal medication management and improved health outcomes for all older persons. Founded in 1969, ASCP is a non-profit membership organization currently based in Alexandria, VA.
ASCP represents over 9,000 pharmacy professionals, including students, serving the unique medication needs of the senior population. Members range in the services they provide and serve seniors in a variety of settings. Tameka Brown, ASCP Pennsylvania Chapter coordinator, said the ASCP national office tabulated the election results.